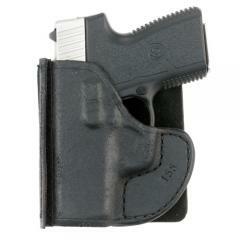 The Aker 155 Pocket Protector Express Holster is an innovative pocket holster designed to eliminate the problem of printing for enhanced concealability. A wallet-shaped flap on the leading edge breaks up the firearm's silhouette and helps to keep it wedged in, allowing you to draw your weapon without taking your holster with it. It can also be removed when not needed. The holster's design automatically places the grip in the right position for a natural draw with a full firing grip, enhancing your ability to react to emerging threats. The ambidextrous design can be adapted for left or right-handed carry using the hook and loop fastener. The Pocket Protector Express is made from black roughout leather, making it highly durable and increasing friction against the pocket for a more secure fit.